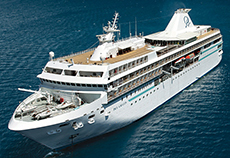 Designed specifically to glide through the shallow seas of the South Pacific, The Gauguin is the flagship of Paul Gauguin Cruises and a small-ship cruiser's dream. She delivers travelers to intimate ports inaccessible to larger cruise ships, all the while providing an onboard experience that is nothing short of luxurious. Guests aboard this luxury cruise enjoy spacious suites and staterooms (more than 70% with private balconies), an onboard watersports marina, three dining venues, an extensive spa, and five-star service. Life onboard also reflects the beauty and rich cultural heritage of the islands she calls upon, with a warm, friendly feel, informal setting, and even a beloved troupe of Gaugines and Gauguins — local Tahitians who serve as cruise staff, entertainers, and storytellers. Kids Sail FREE OR Third Adult Sails for Reduced Rate. 50% of Standard Cruise Fares. *Savings are reflected in the fares shown. Cruise Only Fares are per person, based on double occupancy. Port, security, and handling fees are additional per person. Cruise ship fuel surcharge may apply. Other restrictions may apply.